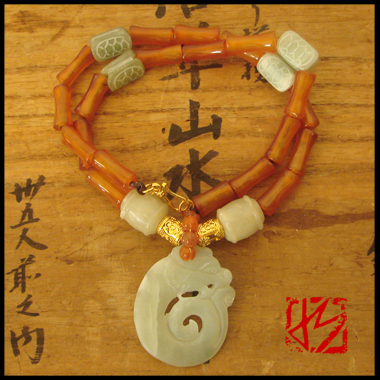 In Asian culture, the dragon is a powerful yet benevolent creature and therefore a favorite of the emperors. 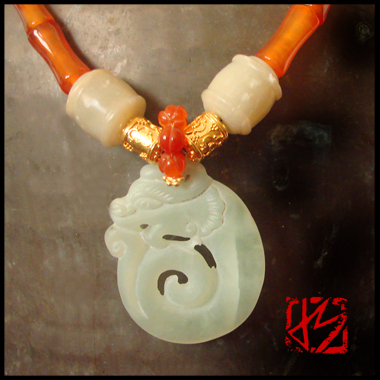 They are thought to hold auspicious powers over water and rainfall, thus this depiction carved in icy green jade of a dragon formed from a swirling wave. Carnelian agate carved to resemble bamboo from northern China, representing flexibility and endurance; antique barrels and carved turtle shells, symbolizing longevity and wisdom, carved in jade; vintage carved carnelian melons from India; 22 kt gold vermeil drums and clasp made in Bali pendant hangs another 2.5"